If taking a romantic getaway was your 2014 resolution, then you have lots to look forward to next month. Hotels far and wide are putting together some nifty Valentine's Day packages to help lovebirds get the most out of the holiday. From free spa treatments, to add-ons like champagne and rose petals, there's a trip here to suit every taste, and save you some money. In Curaçao, the Santa Barbara Beach & Golf Resort is making itself extra-accessible to lovers on a budget with their "Love In the Caribbean" package, which is available even after Valentine's Day. Starting at $379 per night with a 3-night minimum, this deal packs in a couple's massage, daily breakfast for two, a complimentary dinner at Shore, welcome cocktails, and (why not?) a two-day car rental. Valid for stays through the end of 2014. If you had to splurge on a Valentine's Day package, what better way to do it than with a romantic ballet? The St. Regis Atlanta has put together "A Legendary Love" package (starting from $750 per night), which includes two VIP tickets to the Atlanta Ballet's Romeo et Juliette. In addition to securing the tickets (which normally cost around $120) ahead of time, the hotel guarantees the best seating available. When you return to the hotel, expect a St. Regis Suite, which comes with Butler Service and, of course, a balcony. Valid for stays from February 7-15. Settle into peaceful Williamsburg, VA with the Kingsmill's "Bed & Breakfast" package (from $219 per night), which includes breakfast in the Bray Dining Room, overlooking the James River. The hotel is also offering a 50-minute couple's massages at the Kingsmill's Spa for $220, so you can enjoy full pampering for under $500. Valid for stays through the end of 2014. It doesn't get more intimate than the Brentwood Inn, Jackson Hole's award-winning lodge where every room comes with a fireplace, private deck, and backyard views of the Grand Tetons. Book the hotel's "Natural Valentine's Weekend Package" for a pampered two-night stay, including a guided naturalist hike (or, if you prefer, ski lift tickets), a sleigh ride through the National Elk Refuge, dinner for two, and breakfast in bed. The package starts at $599 for two nights, a deal when you consider all those elements booked separately would total about $800. At Fiji's Jean-Michel Cousteau Resort, couples don't just get romantic extras like wine and massages. They get two free nights, too. As part of the "Valentine's Romance" package, guests stay in telephone- and TV-free "bures" (traditional thatched-roof huts), and receive a bottle of sparkling wine, two 60-minute massages, a half-day private island tour, and private dinner. Pay just $813 per night for five nights in an Oceanfront Bure, and get two nights free – a 50 percent savings overall. 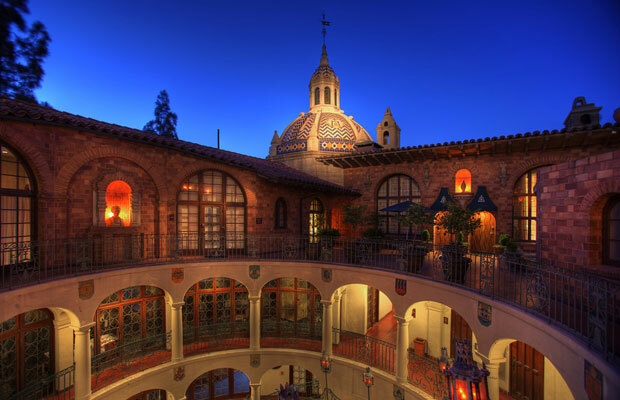 Sixty miles from Los Angeles, the 111-year-old Mission Inn Hotel & Spa is one of Southern California's most stunning historic properties, with its adjoining St. Francis of Assisi Chapel and quaint porticoed walkways. With the "Celebration of Love" package (from $439), you'll receive overnight accommodations, breakfast, a 50-minute couple's massage, a pair of the hotel's famous Casey's cupcakes and a bottle of Pinot Noir – a handy $50 in savings on booking all the items separately. New York hotels are known for being generally unaffordable, so usually anything under $200 gets our attention. The Court has a few things to offer: newly-renovated rooms, a sleek bar, and easy access to Manhattan's myriad tourist attractions from its 39th Street location. Next month, rates at the hotel start at just $152 per night. Add an extra $125 for a bottle of Veuve Cliquot, rose petals, and chocolate-covered strawberries. Valid through the end of 2014. Located in southern Utah, Red Mountain Resort is an easy drive to landmarks like Bryce Canyon or Zion National Park. That makes this a perfect home base for adventure-seeking couples, who can also settle into a long weekend of pampering with the "Essential Retreat Package" ($200 per night). It includes a $100 resort credit for each guest – in total, a savings up up to 66 percent. Valid for stays from February 1 through March 15. Staying in one of Santa Fe's most historic hotels is special on any day of the year, but this Valentine's Day, the Hotel Santa Fe Hacienda & Spa is throwing in a whole bunch of goodies to sweeten the deal. The "Valentine's Day Special" (from $259 per night) offers junior suite accommodation, plus breakfast for two, fresh flowers, chocolate-dipped strawberries, and champagne. Booking all those things separately for a two-night stay during the week would cost around $675, making this a nice deal. Valid for stays February 7-22. We're liking Southern California's Rancho Bernardo Inn for lots of reasons, but especially for its new restaurant AVANT, which focuses on "wine country dining" (think Sonoma duck breast, quinoa and avocado salad, and New Caledonia blue prawns). Guests who book the "Love You S'more" package (from $452) will get dinner at AVANT, plus a gourmet s'more making kit with red velvet cookies, white chocolate marshmallows, Reese's peanut butter cups, and cinnamon graham crackers. Valid for stays through February. No Waikiki hotel has received more hype in the past few years than the Modern Honolulu, and with its rooftop "sunset pool" and minimal white rooms overlooking the harbor, it's easy to see why. The "Uncommonly Suiteheart Deal" (from $489 per night with a 3-night minimum stay) offers accommodation in an oceanview suite, breakfast daily, a 50-minute spa treatment of your choice, and a $200 resort credit to use at the spa, restaurant, bar, or in-room dining. Valid for stays through the end of 2014. Looking to inject a little fire into your romance this Valentine's Day? Hard Rock Hotel San Diego has you covered. The 420-room, rock-themed hotel's "Crazy In Love" package (from $239 per night) guarantees a complimentary suite upgrade, chilled champagne and strawberries, and VIP access to the hotel's two rooftop nightlife spots, Float and 207. Better yet, if things go well and you feel like proposing, Hard Rock's "Put-a-Ring-On-It" program offers a dedicated team of "romance specialists" who can help you pop the question in style, whether that means broadcasting your sweetheart's name on the side of the building, or renting an exotic car for the night. "Crazy In Love" package valid for stays through the month of February. If you're a guy and Valentine's Day means nothing more to you than another day closer to spring, here's a worthy incentive to get into the holiday spirit: Jackson Hole's Teton Mountain Lodge & Spa is offering a "Manuary package," including a 3-night stay, a bottle of Wyoming whiskey, and two vouchers for a hot shave at the Whiskey Barber. 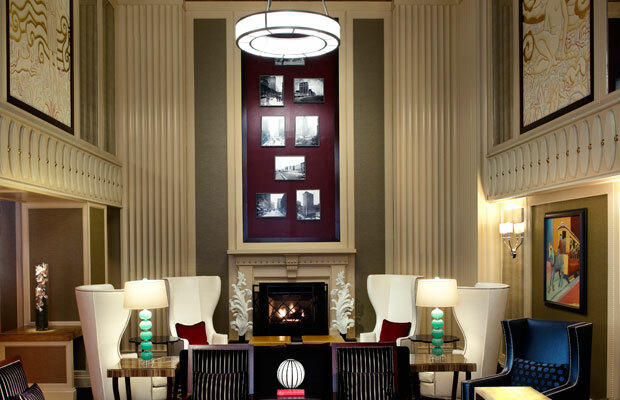 From $274 per night; valid for stays through February 22. There's nothing like Valentine's Day to make a boutique hotel pull out all the stops for its single lady guests. And this year, Chicago's Hotel Monaco is the place to be; its "I'm Too Booty-Luscious For You Anyway" package offers Spa Suite accommodations, complimentary Mojo Spa beauty products, a $20 iTunes gift card, a bottle of champagne, and a $40 voucher towards brunch at on-site restaurant SWK – in total, a savings of nearly $200. To book, mention the code "BOOTY." Valid for any Thursday-Sunday stays in February.